Martin Yale BCS212 high capacity 12 up business card slitter easily converts 8-1/2" x 11" sheets into finished 2" x 3-1/2" business cards with a simple two pass operation. This premium desktop slitter features perfect cuts, catch tray, receptacle and adjustable feed to accommodate different types of material thickness. The BCS212 requires manual insertion of the paper and contains adjustable paper guides so you are not limited to cutting only standard 2" x 3-1/2" business cards. This unit does not accommodate bleed printing. Simply insert a standard sheet of 8-1/2" x 11" paper through the 12 up card slitter and the result is three strips of 3-1/2" x 8-1/2" on the first pass. On the second pass, the machine finishes the job by taking the 4 up sheets and cutting them down to 12 cards (2" x 3-1/2"). 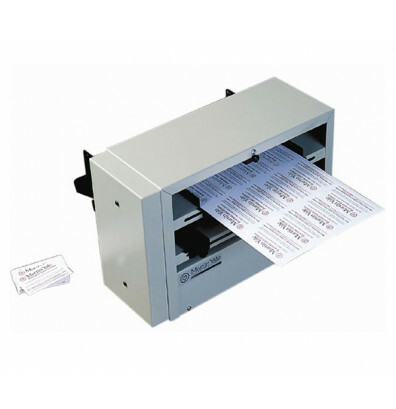 This easy-to-use card slitter is great for churches, classrooms, offices and quick print shops.